Friday is back again! That sneaky devil finallyyyyy showed up! Hahaha I'm pretty excited for the weekend. Mostly just for the pleasure of sleeping in! Check out some of the things I'm lusting over this week! First, I seriously, seriously, seriously missed the memo on stripes! I think I may have like one striped sweater in my closet?! What?! I need to get a striped top like yesterday! 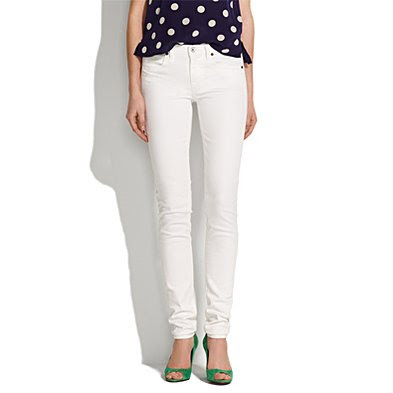 Another must on my list is a pair of white denim skinnies! I love their crisp clean look. I've been writing about needing a pair in my closet all over the bloggersphere, but haven't bit the bullet! Maybe this weekend? I think, YES! Another denim piece that keeps popping up is the denim jacket! I found a cute and colorful alternative to the original that is just too fun! Finally, I'm crushing on cute easy hairstyles. This is a twist on the modern ponytail that still makes you look super put together while only taking you a couple of minutes to execute! I almost forgot! It's Cinco de Mayo!! Do any of you lovelies have some fun plans! I'll most likely be trying to find the perfect margarita and guacamole somewhere! Have a spectacular weekend y'all! LOVE the first look! So adorable! Check out my Fab Friday Beauty Tip if you have some time today.. it features a great DIY Mother's Day gift idea! I seriously need a pair of white skinny jeans. The only pair I was ever able to find was my maternity jeans. Ha ha! I came soooooo close to buying white skinnies last weekend but got pale yellow instead. I couldn't see myself wearing the white ones...something about the horror of white jeans from my past. But this week alone I've seen probably 6-7 blogs either wearing or talking about wanting a pair. I'm kinda kicking myself! I LOVE the colored denim jacket! I'm so looking for white skinnys as well! Let me know if you come across a great pair. The plan is to have a crop style, boot cut, skinny, and then a cropped skinny. I have a lot of hunting to do. Such great choices! I love striped tops -- such an easy way to look put-together. And I really love that colored denim jacket! I want one too! I seriously need more striped tops too! I've only got 2 or 3, they're so easy to pull together an outit too! These are all great inspiration photos, loving the bow pinned up on the ponytail! i am hoping to be having a little fiesta tomorrow!! I want all of that first outfit. i'm really looking forward to sleeping in this weekend as well. and as for stripes, let's just say i bought a grand total of three of the exact same striped tops (in different colors of course) from forever21 last week. my obsession cannot be helped! ha! i hope you have a great friday & a relaxing weekend! You have a great blog! Thanks for stopping by mine. I neeeeeeeeed white skinnies too! great finds as usually hun! thanks for sharing. Loving stripes right now. J.Crew has the most amazing selection of striped pieces right now! LOVE your favorites and the pony tail is so cute! great choice, stripes are my all time fav!!! i love cute easy hair styles. great inspiration! Love stripes and colored denim jackets! Nice picks! Happy Friday! I love the red pants and the orange jacket! O love everything.. great post dear..
Oooh, love the colored denim! Love the idea of the black and white stripes with red pants. I'm totally gonna try that soon! Great inspiration pics! I have plenty of stripes (they've always been a favorite of mine), but I'm also in the market for a good pair of white skinnies. You could put one of each of pieces you listed together and create on gorgeous outfit! P.S. Thanks for checking out my scans and notd post. Yes, Zac is super cute! that stripe top is really cute . . . ive been into white in general and white denim is no exception! I have been looking for white skinny jeans as well. perfect for summer. I just to wear the first one combo, and I love it! Hello!! thanks for visit my blog!! I love all this clothes! Do you want to follow each other?